File photo - A Border Collie mix dog in the water. The Ocean Pines Association voted earlier this year to euthanize around 300 geese to protect local water quality, but that tactic both angered residents and proved to be largely ineffective. Geese have returned in numbers, so the association decided this week to hire Maryland Geese Control. The association's general manager, John Bailey, says the company uses border collies trained not to harm the birds but will chase geese out of the water and off the land. The company will also remove nests, transport injured birds to rehabilitation centers and addle eggs. 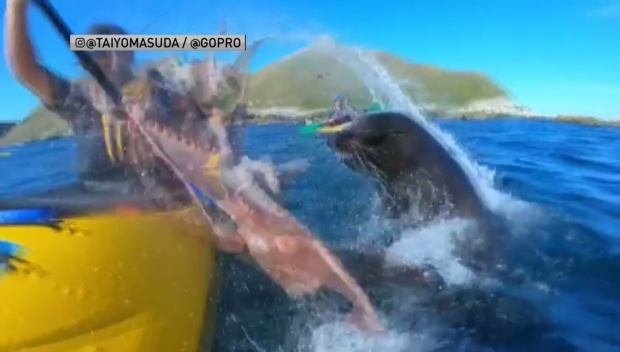 GoPro video footage captured a seal slapping a kayaker with an octopus off the coast of Kaikoura on New Zealand’s South Island on Sept. 22.